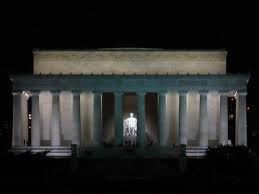 ... 1922 (90 years ago today), on the Mall in Washington, D.C., a marble commemoration of President Abraham Lincoln, who led the country through a Civil War and was assassinated just as it came to an end, was dedicated. Leading the ceremony at the Lincoln Memorial (left) was Chief Justice William H. Taft, himself a former President. (credit for photo of Memorial at night) Among those who attended was Robert Todd Lincoln, the fallen leader's only then-living son. Among the events to which the Memorial since has served as a backdrop were the 1947 open-air concert by Marian Anderson and the Rev. Martin Luther King Jr.'s "I Have a Dream" speech in 1963. Labels: Abraham Lincoln, DMA, Marian Anderson, Martin Luther King Jr.